Exide Marine Stowaway Starting Batteries. All Batteries are Retail Price including GST. We also do a Bulk Buy Price if needed. 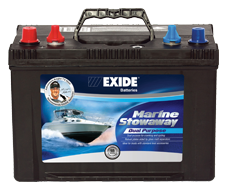 Exide Marine Stowaway Dual Purpose Batteries.